The Decoy Bride, a recent addition to Netflix Instant’s film catalog, has serious nerd cred. 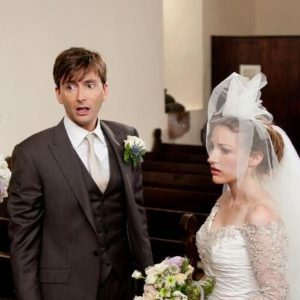 It stars David Tennant, who needs no explanation, and Kelly Macdonald, known most recently for lauded work on Boardwalk Empire and voicing Merida in Brave. Her other nerdy credits include Trainspotting, Harry Potter and the Deathly Hallows Pt. 2, and Nanny McPhee (What? I saw that in theaters in England. It’s got Emma Thompson, Colin Firth, and that adorable kid from Love Actually, what’s not to love?) The cast is rounded out by Ugly Betty’s Michael Urie and Black Books’ Dylan Moran. I’m placing such emphasis on the cast because that’s the reason to watch The Decoy Bride. As a romantic comedy it’s not particularly compelling, but it’s a fun movie nonetheless. My husband wandered in about a quarter of the way through the film and laughed at a number of parts, high praise from a guy who’s super low key and shares my suspicion of romcoms. James and Lara. 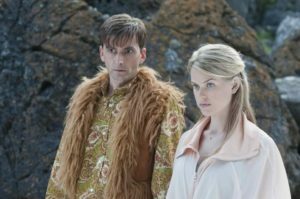 Yes, you’ll get to see David Tennant parade around in that outfit. He plays the bagpipes, too. David Tennant plays James Arber, an up-and-coming author who’s engaged to Hollywood superstar Lara Tyler (Alice Eve). No matter how many times they try to get married in secret the paparazzi find a way to ruin the proceedings. The couple decides to hold their nuptials somewhere so remote that no reporter will ever find them. That place is Hegge, a tiny island off the coast of Scotland. It’s home to Kelly Macdonald’s Katie NicAoidh, the home she’s just returned to after a failed relationship and stalled career in Edinburgh. Only 75 people live on Hegge and most of their ages match the number of people on the island. Katie is drawn into the crazy scheme Lara’s agent, Steve (Michael Urie), hatches to distract the paparazzi from the real wedding, by default of being almost the only young woman on the island. One intrepid paparazzo, particularly obsessed with Lara (and hated by her) makes his way to Hegge. As soon as she notices him, Lara takes off. Steve scrambles to find her and also keep Lara’s disappearance secret from James, whom he doesn’t trust to attract even more attention while he dashes around after Lara. So, Steve decides to find someone they can disguise as Lara to fake-marry James, let the press get their photos, and then once all the journalists have left actually have the real wedding. That’s where a reluctant Katie makes her entrance. She’s not interested, not for any amount of money: not until Steve brings up her mother. Katie’s mother is dying and is desperate to get off the island and see the world before she passes. They just don’t have the funds to do so; Steve is able to persuade Katie to go along with his plan using this angle. I object to marrying her now, but in about four or five hours I will be ready to ditch my actual fiancÃ©e for her. Through a series of slapstick events (the highlight is Katie’s terrible American accent), James ends up spending the majority of his wedding day with a girl who is not his fiancÃ©e and whom he just met. Because this is a romantic comedy they go on even more wacky adventures together. They include: James getting into multiple fights with other men over women (Lara in one case, Katie in another), Katie not knowing who James is and dissing his book in front of him, Katie and James hating each other at first, getting locked in a room and drunk together, James saving Katie’s life and them growing closer because of it, them getting soaked and having to get changed next to each other, awkward meeting of a parent, and more. I can summarize half of the film here because you shouldn’t tune into The Decoy Bride for its plot. You might say, “Does anyone watch romantic comedies for their plots?” and my answer would be: Yes, I do. Maybe not exactly, but I’m picky about romcoms. Maybe it’s because I’ve gotten hooked on kdramas, which give me tons of development between the main couple, but I need more than goopy eyes. I need to be convinced that the pair work well together, and for me that takes more than chemistry between the two leads (which Tennant and Macdonald have in spades).